A couple of months ago I got an email from an old friend asking if I would be at all interested in doing an overnight, self-supported, 100+ mile relay through the Maine wilderness. To which I of course responded, Hell yeah! Accordingly, last week I packed up snacks, gels, gear for all possible weathers, my Garmin watch, a headlamp, and pretty much anything I owned with a reflector or flashing light. 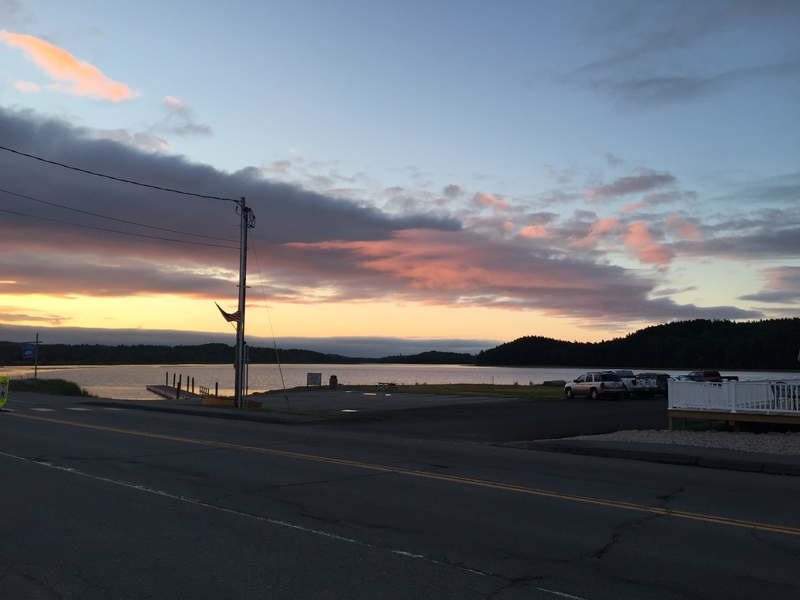 Finally after many hours and several flight delays, I arrived in Bangor at 1:00 Friday morning, 21 hours before the start of the second annual Downeast Relay. 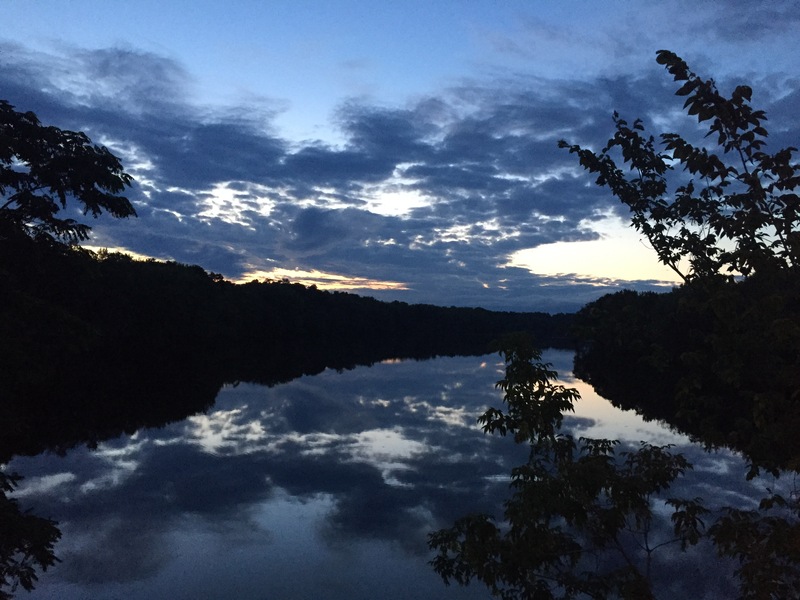 I had started this post by writing a pretty thorough race report, but I soon realized that what I really wanted to convey and remember about this race (aside from the sight of a bald eagle flying overhead or sunrise over a bog) were the things I learned out on the trail. 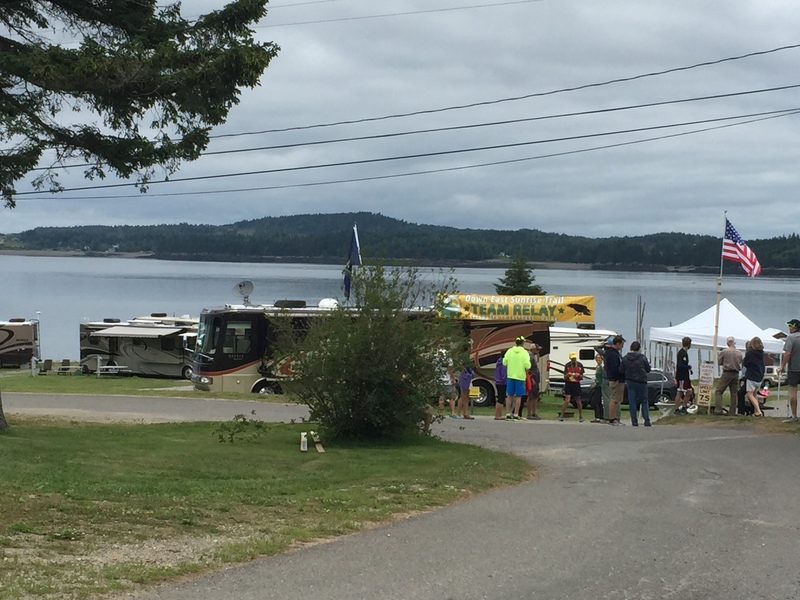 The Downeast Relay was a totally different beast than anything I have ever tackled before. I didn’t fully appreciate just how different it would be until I got out there, but I wouldn’t trade the experience for anything. I am eternally grateful to my team and our indomitable Sherpa/shuttle bunny for all the organization they did before race day. We had decided to use two vehicles to give everyone more space for gear, but that meant that in addition to our dedicated driver, one runner had to drive each leg and two others were needed for navigational duties. The driving directions provided by the race organizers were great, but navigating the back roads of Maine in the dark still took considerable focus and attention. Given the remoteness of the trail, the cars often had to traverse much greater distances than the runners in getting to the hand-offs, and on shorter legs there was little time to waste in getting to the next dropoff. In some cases we actually leap-frogged cars to ensure that the next runners made it to their rendezvous points in time. In addition to the driving, navigating, and cheering runners in and out, there was also the preparation of gear and nutrition for the next leg, so down time was minimal. I’m no stranger to all-nighters—I was an architecture student at MIT, which rendered me nearly nocturnal for several years. That said, none of my previous experience prepared me for running a race in the middle of the night. I found that the mental fatigue took a greater toll than the physical tiredness. By my third leg I was putting considerable effort into staying focused and on pace. (It probably didn’t help that it was a boring, slightly uphill 7-mile stretch that went straight ahead with nothing to look at but seemingly identical pine trees.) I have been an enthusiastic follower (read: uber-geek) of ultra-running for years, and even though my relay distance was nowhere near ultra levels, I feel like I got a tiny taste of the challenges of day-long events. I wore all of the shirts with the exception of the short-sleeved one and never changed shorts, but I was very happy to have fresh shoes and socks to change into as the race progressed. Organization. A few of the more experienced runners organized their gear in Ziploc bags clearly labelled for each leg. I will definitely follow suit next year. Anything that can eliminate thinking or stress or frantically digging around a dark car at 4 AM trying to find your gels is worth the effort. Nutrition. This was a tough one. Given that our race started at 10 PM, I wasn’t really sure how much, or even if I would feel like eating. I brought Accelerade powder and a gallon of water, a bag of nuts, 4 gels (2 of them with 20 mg of caffeine), 2 bananas, a couple of protein bars, and a thermos of coffee. I nibbled a few nuts at a time throughout the night, which I think was a good move since they packed a lot of fat and calories into minimal bulk. I also kept up a steady stream of coffee, counterbalanced by a lot of water to stay hydrated. The surprise was how much I was craving sugar by the end of the race, though—I’m fairly well fat-adapted and though I had brought some carb sources I hadn’t expected to dip into them too much. It was probably the lack of sleep combined with a pace much closer to a 10K than a long run, but I found myself really wanting something sweet as the race wore on. I ate a banana and a half and took a caffeinated gels on each of my last two legs. There was also a bag of mini peppermint patties floating around the car, and I had one of those before each of the last two legs as well. I felt like I was eating a lot—certainly much more than I would have in a marathon—but I also had a very light dinner before the race and totally missed breakfast on Saturday morning, so I still probably ran a caloric deficit. I was one of the few on our team that did not have any gastro issues at any point, so either I got lucky or the fueling strategy worked out. Sleep. Before. As much as possible. Training. Obviously run trails if you can to build up your stabilizers. Perhaps more importantly, get used to the fatigue. One member of our team said that he had done a few clustered workouts on a consecutive afternoon, evening, and morning, which I thought was a great idea. It would also be useful for fine tuning a fueling strategy. I wish trail running in the middle of the night were a more readily available pursuit—I really had a much more direct experience of running and my own mind than I ever have before. It was actually somewhat unsettling—I experienced time and space very differently out on the trails. When I was running through the dark without discernible landmarks, I really lost all sense of time passing, from what time of night it was to how long I had been out there. My perception of distance was incredibly accurate, though, and—maybe this was just the lack of sleep—but it seemed as though time were only evidenced out there as the byproduct of covering a distance at a given pace, and didn’t objectively exist outside of me. It was both terrifying and freeing in the way that real encounters with ourselves usually are.